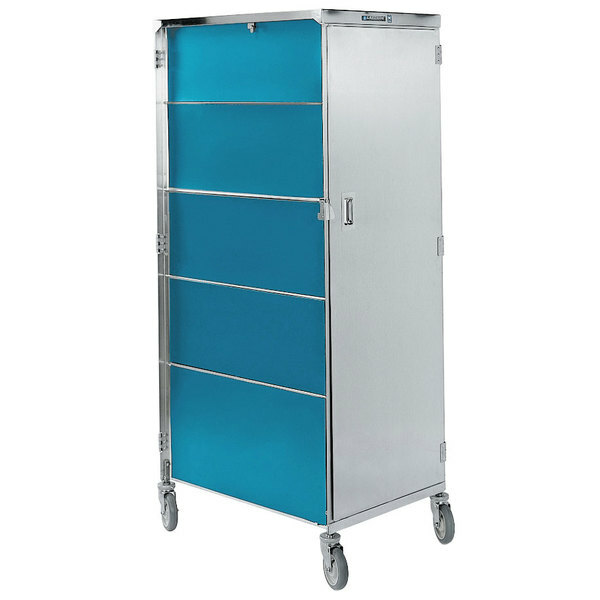 The compact design of this Lakeside 657 Compact Series stainless steel / vinyl tray cart will make it easier to maneuver through narrow hallways and tight storage spaces! This unit holds (20) 15" x 20" trays and has a 6" clearance between ledges. Each ledge holds two trays. This model features one front door and one back door so you can load and unload trays from either side! The doors open 270 degrees for convenient, unobstructed access to the cabinet, while a long-life door latch will hold up to repeated opening and closing. The unit is made of welded stainless steel for superior durability and has a vinyl exterior for enhanced appearance. Rust and corrosion-resistant, the stainless steel construction is also easy to clean and sanitize. A convenient and efficient tray delivery unit for any food service operation, this tray cart features 5" all swivel stainless steel casters for easy transporting.